​Liverpool returned to the summit of the Premier League after coming from behind to beat Southampton 3-1 on the south coast. The Saints broke the deadlock after only nine minutes at St. Mary's, courtesy of Shane Long's 50th Premier League goal, as he controlled Pierre-Emile Hojbjerg's flick-on before firing his effort beyond Alisson. Despite Liverpool being below par throughout the half, they did enter half time level thanks to Naby Keita's first goal for the club in the 36th minute, with his header from Trent Alexander-Arnold's cross having just enough on it to beat Angus Gunn. 80th minute before the Reds finally managed to break down a stubborn Southampton to score a vital second, with Mohamed Salah netting his 50th Premier League goal in a Liverpool shirt in the process, as he led a breakaway at pace before finishing beyond Gunn. The game at St. Mary's wasn't only a huge one for Liverpool, but also for Southampton, who were in need of the points to ease fears of relegation, and Ralph Hasenhuttl's side certainly began the game with a purpose. Targeting the visitors' right-hand side, the Saints got themselves into great positions time and again, taking an early lead after nine minutes, while their energy and fight was too much for their title-chasing opposition to handle. Southampton were visibly annoyed with Liverpool's equaliser, feeling Salah was offside in the build-up, although broadcasters stated it would have stood if VAR was being used, with the home side failing to clear to earlier crosses before Keita's header. The energy and ambition however was lost in the second half as they sat back, although the winner coming from a Southampton corner is likely to irk Hasenhuttl greatly, especially coming in the final stages of the game. Starting XI: ​Gunn (5); Valery (5), Bednarek (5), Yoshida (6), Vestergaard (5), Bertrand (6); Ward-Prowse (6), Romeu (6), Hojbjerg (7), Redmond (6); Long (7*). Substitutes: Sims (6), Austin (5), Armstrong (5). Although he was on the pitch for only 62 minutes, partly due to his lack of minutes this season, Shane Long gave Liverpool an uncomfortable evening on the south coast. His pace and endeavour always gave Southampton an outlet while defending, with the striker giving Alexander-Arnold and Joel Matip a difficult evening down the right-hand side of the Reds' defence, while his performance was capped with a well-taken goal after only nine minutes. 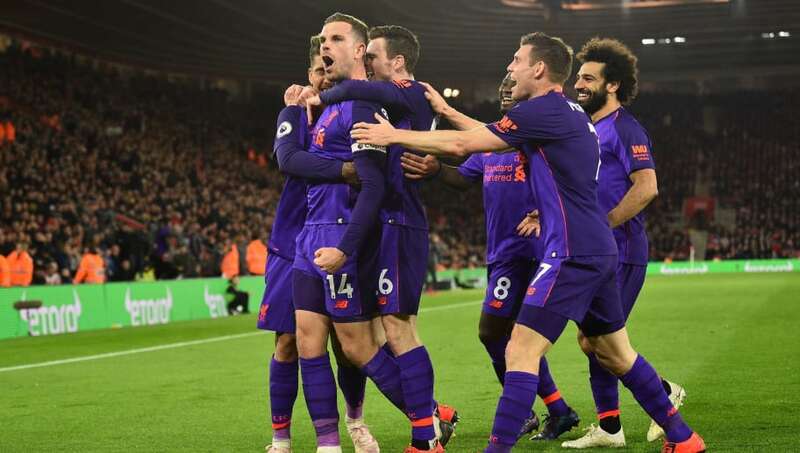 Much has been made of Liverpool's midfield this season, although it was the introduction of two players - James Milner and Jordan Henderson - in the second half that turned the tide of the game. The Reds were too passive in the opening 45 minutes, as they failed to match the intensity their hosts were playing at, yet the fact they entered half time on level terms also helped them in the pursuit of three points in the second period. 88' - GET IN! Henderson arrives at the perfect time to tuck away a nice pass from Firmino. YES!!! Milner and Henderson injected more life into Liverpool going forward, Henderson especially, who laid the ball onto Salah for his individual goal, before netting the third late on, to help Jurgen Klopp's side pass the latest test of their title-winning credentials and return back to the top, with Manchester City in FA Cup action. Starting XI: Alisson (6); Alexander-Arnold (6), Matip (7), Van Dijk (6), Robertson (6); Wijnaldum (6), Fabinho (6), Keita (7); Salah (7), Firmino (7), Mane (6). Substitutes: Milner (7), Henderson (8*), Lovren (N/A). He's a player that certainly divides opinion, but Jordan Henderson certainly made an influence when he was introduced during the final third of the game. A goal and assist represented a great cameo for the England international, who give Liverpool more impetus and purpose as they searched for their second of the game, before ending the game as a contest with a goal of his own late on. Credit also to Salah who netted his 50th Premier League goal for Liverpool in some style at such a crucial moment. Brilliant from Roberto Firmino and a great, deserved moment for Jordan Henderson - arriving late to finish and put #LFC 3-1 up - who has been instrumental since his introduction. Great win for the Reds. They don't give Up, Henderson and Milner brilliant when came on. Southampton will be looking to bounce back for their next game when they host Wolves in a weeks time. Liverpool meanwhile turn their attention to Champions League action in midweek for the first leg of their quarter-final against FC Porto, before hosting Chelsea in the league days later.